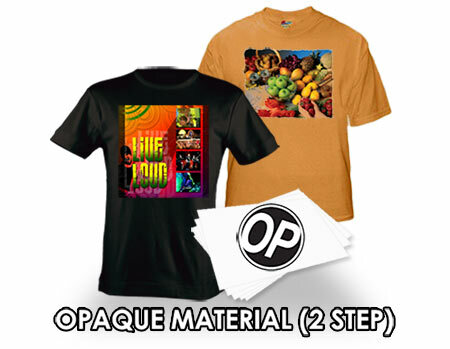 (2 Step) Heat Transfer Paper - The tried & true method for dark garment printing. These have an adhesive backing & it must be used in conjunction with one of our heat transfer papers: TransferJet, CL Non-Oil, High & Low Temp Laser/TECHNI-PRINT or Premium Plus CLC. Expect permanent commercial results on dark garments. It will not come off in the wash! This opaque fabric material provides the white backing needed in order for your colors to show up correctly. You do not place this Opaque Material in your printer! Must be applied by Heat Press only! NOT Compatible with Cuttering Plotters.